It’s been one of those weeks where I haven’t felt like making dinner. I’m pretty sure it happens to all of us. It’s been hot, which makes standing over a hot stove unappealing. And I’ve been tired and distracted by other projects. When dinner time rolls around, I’ve been feeling limp and listless, like this celery that I picked up at the market because it was so beautiful and fragrant and then ignored for a full week. And while it’s easy to be inspired by vegetables at their peak of ripeness, it’s harder to get excited about a bunch of celery that’s past its prime. Luckily, Fuchsia Dunlop came to the rescue, with a brilliant recipe from her excellent book Every Grain of Rice. It’s a book that’s taught me so much about simple Chinese home cooking, and I can’t recommend it highly enough. 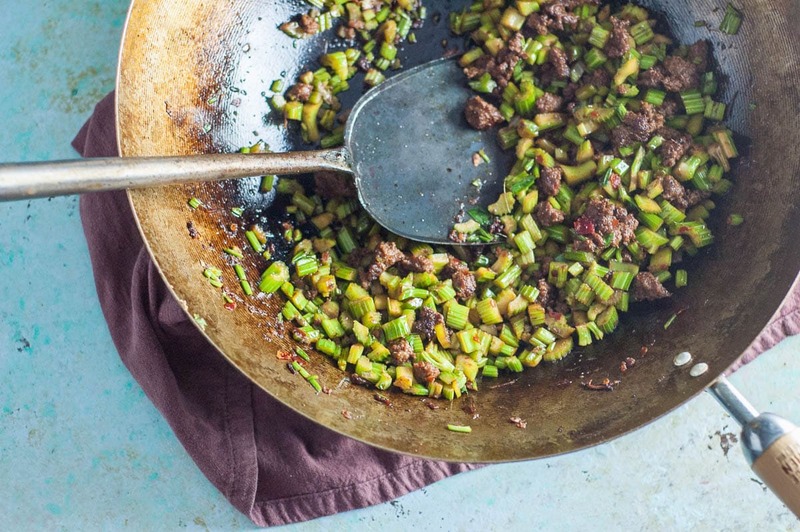 So many of the recipes in it, like this Sichuan Send-the-Rice-Down Chopped Celery with beef, have a short ingredient list, are quick and easy to make, and are so incredibly delicious. I tend to overlook celery as a primary ingredient for a dish. I use a stalk of it here or there as an aromatic component forming the base of a dish, like in a mirepoix. But I can’t say I’m exactly surprised that I let a bunch of it languish, untouched, for the better part of a week. I might have overlooked this recipe altogether–chopped celery with ground beef doesn’t exactly get me excited–but when both Luisa and Molly recommended it, I knew it had to be something special. And I think send-the-rice-down has a poetic grace as an adjective, which made me feel even better about giving it a go. A quick blanch in boiling water and a dunk in an ice bath revived the celery. And this dish has the most amazing fragrance. 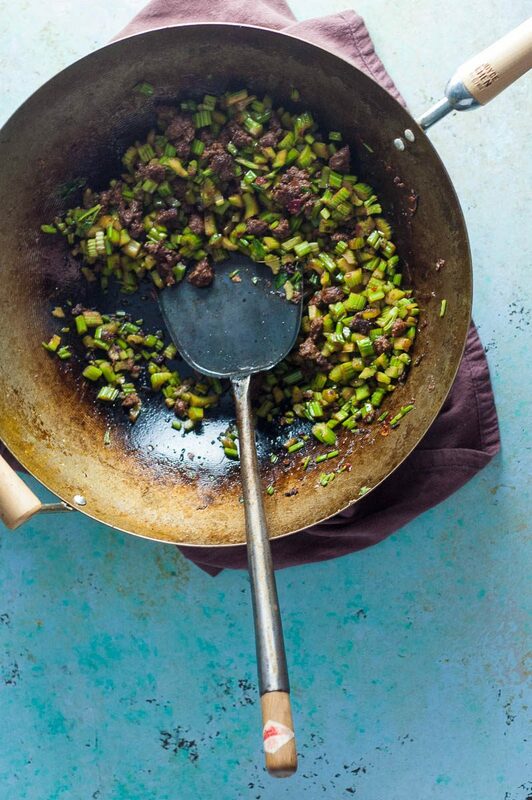 When Dan came home when I was in the middle of cooking, he commented on how good it smelled, and that was just the blanched celery, before the ginger and chili bean paste start sizzling and make everything deeper and brighter. 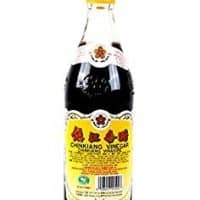 It’s worth tracking down Sichuan chili bean paste and Chinkiang vinegar (sometimes called black vinegar), which are inexpensive (especially if you can find them at a local market) and keep for ages and will put lots of other great dishes in easy reach on a weeknight. Seriously, just make this one already. This dish makes me appreciate just how fragrant and flavorful celery can be. It really forms the backbone of this dish. The ground beef here is more of an accent than the main part of the dish, and I actually think vegetarians could successfully substitute an extra firm smoked tofu and have a nice dish here. 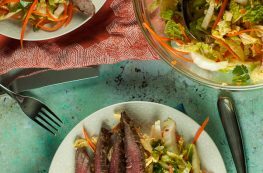 There’s no easy substitute for Sichuan chili bean paste or Chinkiang vinegar, but both are easy enough to find online if you don’t have a local source for them. (And if you get Dunlop’s book, you’ll find plenty of other uses for these ingredients.) Otherwise, this really easy to make and comes together quickly. The fussiest parts are destringing and blanching the celery, but they only take a few minutes. Like the name suggests, this is a dish to eat with plenty of steamed rice. Prepare an ice bath. In a medium saucepan, bring some water to a boil. Meanwhile, de-string the celery and slice lengthwise into 1/2 inch strips. Finely chop the strips. Blanch the celery in the boiling water for about 30 seconds, drain well in a fine mesh strainer and dunk into the ice water. 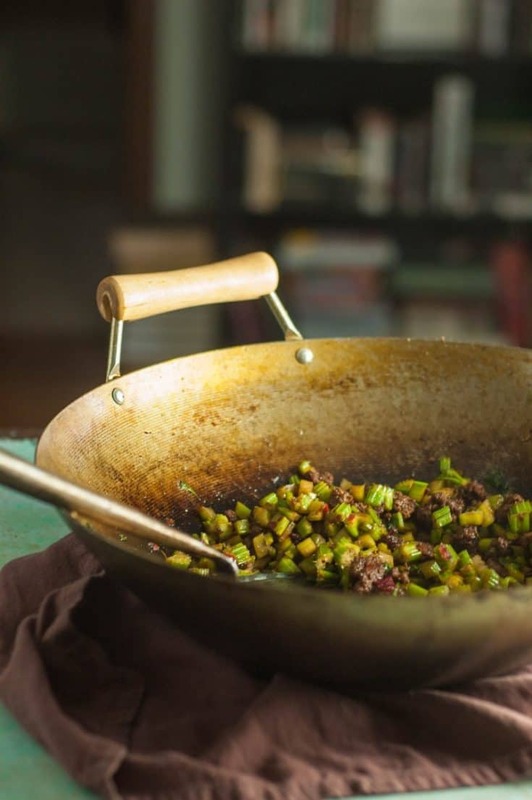 Heat a few tablespoons of neutral oil in a wok or large skillet over high heat. Add the ground beef and cook until it begins to brown, stirring it to break it into small bits. Add the chili bean paste and cook, continuing to stir, until it has turned a deeper red and smells amazing. Add the ginger and stir-fry for about 10 seconds, then add the celery and cook until hot. Stir in the soy sauce (if using) and vinegar. Serve with rice. If you put wilting celery ribs (cut off the root) in a glass of water – they revive really well, really fast! Thanks for the tip, Kylee. I didn’t know that. I know storing carrots in water keeps them crisp and the same thing works for radishes, but had never tried it with celery. This sounds absolutely delicious! I love al of that beautiful green celery and the ginger too! I happen to love celery, even on it’s own but this rice with beef and celery sounds absolutely incredible! I feel celery is a bit of an underrated veggie, which is a shame because it really has a great flavor – I absolutely love how you brought up all its awesomeness in this unique dish! I’ve never used the Chinese variety of celery before but have always been curious how it tastes because it looks so much like cilantro. I need to keep this recipe on hand because I always have greens wilting in the fridge. Send down the rice-I want a big bowl of this!